In this age of social media (I'm looking at you, Instagram) running can feel more like a competition with the world than a personal journey. It seems like everyone is posting their best and fastest runs in the most beautiful parts of the world and we're over here slugging it out on the dreary neighborhood streets. While that dopamine hit feels good with every like and "you go girl" comment on your social media post, if you let it, your runner's ego can hurt you more than it helps. 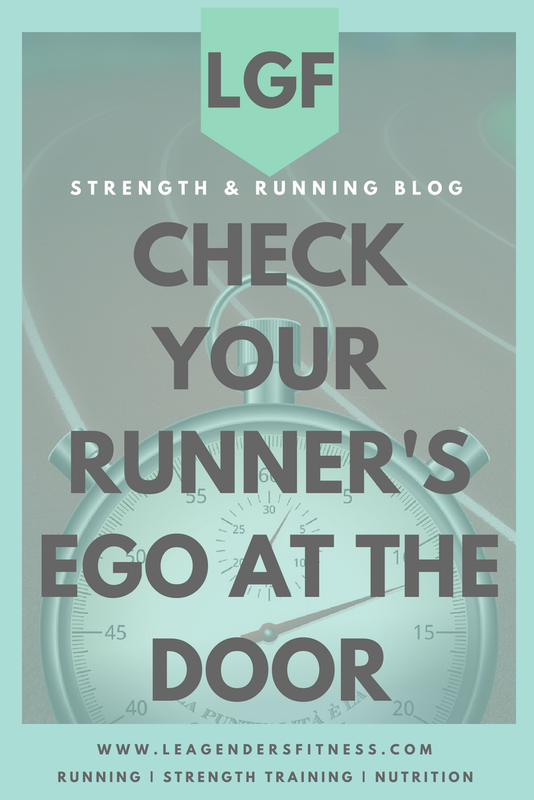 Check your runner's ego at the door...and save to your favorite Pinterest fitness board for late. Your running ego may push you to run too fast on your recovery run days or run farther than your training scheduled dictated. Your ego tells you that you have to finish your long run despite some hip pain. Your ego tells you to go faster when it's beyond your fitness ability. Your ego tells you that you have to run a predetermined number of miles each week, despite what your body is telling you. Listen to your body and check your ego at the door. I'm not immune. I am a running coach, so when I post my GPS stats on social media or on the Strava app, I tend to assume everyone is judging me. If I post a run over a nine-minute mile will everyone ask, isn't she a little slow for a running coach? NOPE. Every run should have a purpose and slow runs are an important part of the plan. If you don't allow your body the proper recovery time it can lead to overtraining, burnout or worse, injury. Just because you can, doesn't mean you should. Slow runs and short runs are all part of the plan. When you go off plan, it should be because you are in tune with your body and are honoring the feedback it provides, not because you have something to prove. You can take an extra rest day if you have new aches, or you can cut your run short if you feel pain, if you didn't sleep well or if you are under a lot of personal stress. Listen to your body to the best of your ability and strive to make the best choices for your long-term success. That means not being a slave to your ego or other people's expectations. Intellectually, I know that no one cares about my pace as much as I do. No one really cares about how slow or even how fast I run. Even if someone had a passing judgmental thought, it doesn't really matter. I run for me. I run slow some days to allow my body to recover. If I tried to run my fastest every day so that I'd have impressive stats to share on social media, I'd probably end up getting hurt. Who does that serve? Not me. Not my clients. Not my social media followers. No one. There is no shame in any pace. It is what it is. There is no such thing as a universal good pace or bad pace. It all depends on your effort level. It is your pace, your level, your ability. If you run a seven-minute mile or a 13-minute mile, there will likely be someone faster and someone slower. Running slow is better than not being a runner at all. Leave your ego at the door and run for you. You don't have to prove anything to anyone. A slower runner who is safe and careful will have longevity in the sport that someone who pushes themselves to the limits every single day will never have. We don't train to show the world what a great runner we already are. We train to improve. Everyone starts at a different place and if we're lucky, we will always have the opportunity to get a little stronger, faster and better, no matter where that falls on the spectrum. Don't run to impress your ego. Run with purpose. So next time you hit the road for a run, check your ego at the front door. Newer PostHow Your Desk Job is Ruining Your Running and What To Do About It.